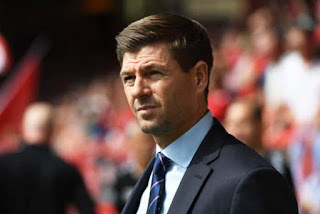 Steven Gerrard has played a blinder with regards today’s trip to Tynecastle – yesterday he ‘admitted’ he’d rather be in the cup final, but make no mistake, the chance to go first in the table with December barely underway is colossal for Rangers and our manager knows it. Sure, the cup final would have been a good showpiece occasion, but the true bread and butter of Rangers FC is and always will be the league. For the club to have a chance of going top today would be one of the biggest achievements yet of Gerrard’s fledgling managerial career, and the boss has played a canny one in playing down the league business and pretending the events in Mount Florida ‘matter’ more. Forget it. They don’t. Gerrard doesn’t care about the cup final, and while being in it would have been nice, we know fine well there’s not a Bear alive who’d take a potential defeat in a cup final v Celtic over a real chance of being top of the table before the year is out. As for the team, well it’s come too soon again for Ryan Kent who remains out of action for the time being, but Borna Barisic is said to be in contention today for a start. Frankly, given the dross we’ve suffered at LB, and accepting Wallace is finished at Ibrox, we’d take a half fit Barisic over Halliday and Flanagan. Candeias’ form has been in flux, and he’s in a weird place discipline wise, so the recent form of Eros Grezda is a likely consideration for Gerrard. Lafferty is set to get a start over Middleton given his experience and his commitment, his decent cameo on Thursday and of course it being at Tynecastle. Coulibaly’s continuing dreadful form in midfield should make way for the composure of Ejaria, while Jack and Arfield will continue. At the back, Goldson’s shaky display v Villarreal may be a factor while Worrall impressed, and McAuley’s leadership will be key at a hostile venue. This is the team we think Stevie will pick, and it’s the team we would pick too. But no doubt he’ll confuse and bewilder us with a leftfield choice! Either way, bring it on. Not even close , there was no way Goldson was ever being left out of this game. We got McAuley, Ejaria and Grezda correct. ‘Not even close’ is a tad innaccurate! Yeah but you picked a guy who was injured (Barisic),put McAuley in for the wrong guy to give the wrong centre back pairing , picked Jack instead of Coulibaly and played Lafferty instead of Candeias.Not close in my opinion lol.